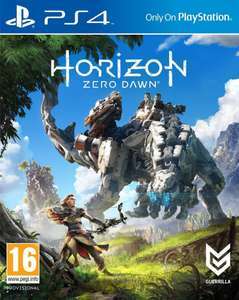 Horizon Zero Dawn an exhilarating new action role playing game exclusively for the PlayStation 4 system, developed by the award winning Guerrilla Games, creators of PlayStation’s venerated Killzone franchise. As Horizon Zero Dawn’s main protagonist Aloy, a skilled hunter, explore a vibrant and lush world inhabited by mysterious mechanized creatures. Embark on a compelling, emotional journey and unravel mysteries of tribal societies, ancient artifacts and advanced technologies that will determine the fate of this planet, and of life itself. Thanks! Looks like a good deal but I'm holding out for the complete edition. Amazing game, but definitely get the complete edition which has the Frozen Wilds expansion on disc. Great deal for a great game, but the frozen wilds is a superb dlc, so I would suggest waiting for it to come on offer. I loved this game, the DLC expansion was great too. Can’t wait for the sequel! This is on my digital pile of shame. Started it and the graphics are impressive. Great price. Just a heads up that if you do buy this, the Frozen Wilds DLC is on sale for £5.79 on Playstation Store instead of the usual £15.99. Well worth it, it's a big chunk of extra gameplay!